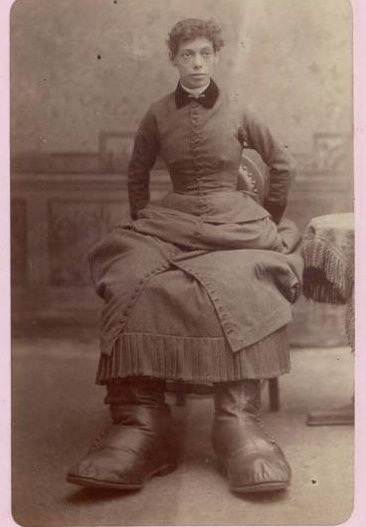 Between 1870 and 1890, bearded girls, dog-faced boys, giants, midgets, fat ladies, lobster-clawed men, and other human oddities sat for photographer Charles Eisenmann. A German immigrant who opened a studio on the Bowery off Prince Street, Eisenmann focused “almost exclusively on the ‘freaks’ of the circuses, sideshows, and living museums of New York’s Bowery area,” states Syracuse University’s Ronald G. Becker Collection of Charles Eisenmann Photographs. Eisenmann captured portraits of many of the human attractions exhibited by P.T. Barnum, whose hugely popular museum on Broadway and Ann Street spawned the dime museums near Eisenmann’s studio. What was his attraction to freaks? As far as anyone knows, Eisenmann never said. In a city crowded with portrait studios and the Bowery getting rougher, tackier, and more honky-tonk every year, perhaps it was simply a good way to make a living. This entry was posted on September 8, 2011 at 2:01 pm and is filed under Lower East Side, Lower Manhattan, Music, art, theater. You can follow any responses to this entry through the RSS 2.0 feed. You can leave a response, or trackback from your own site. Perhaps Eisenmann treated the freaks like human beings, so they were comfortable with him. The book Step Right Up features a reporter who got to know these circus people on a personal level; his portraits of them are interesting, and lead us beyond their looks, into their lives and personalities. 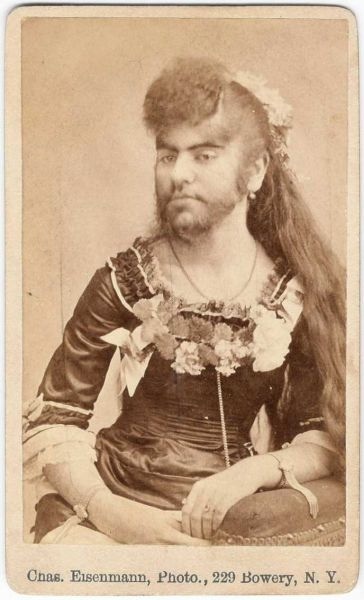 The bearded lady is Annie Jones. A similar portrait is included at page 261 of P.T. Barnum – America’s Greatest Showman, by Philip B. Kunhardt II, et al. This “illustrated biography” features the authors’ private collection of Matthew Brady photos of Barnum freaks. It’s a must-see book!